About 2,000 callers per year receive support via our Helpline and over 400 families receive in-depth support in the community. Scottish Government figures estimate that 20,000 children each year in Scotland have a parent in prison – twice as many as experience a parent’s divorce. Research shows that these children are are three times more likely to develop mental ill health and are at higher risk of engaging in anti-social or offending behaviour than children without an imprisoned parent. information and support and is often the first port of call for families looking for help. Research also shows that prisoners who maintain contact with their families are up to 6 times less likely to reoffend. face to face support until a positive outcome is reached. Our service is crucial in mitigating the long term negative effects that imprisonment can have on families – by providing support earlier we know that we can provide tangible, positive impacts to the families we support and society as a whole. 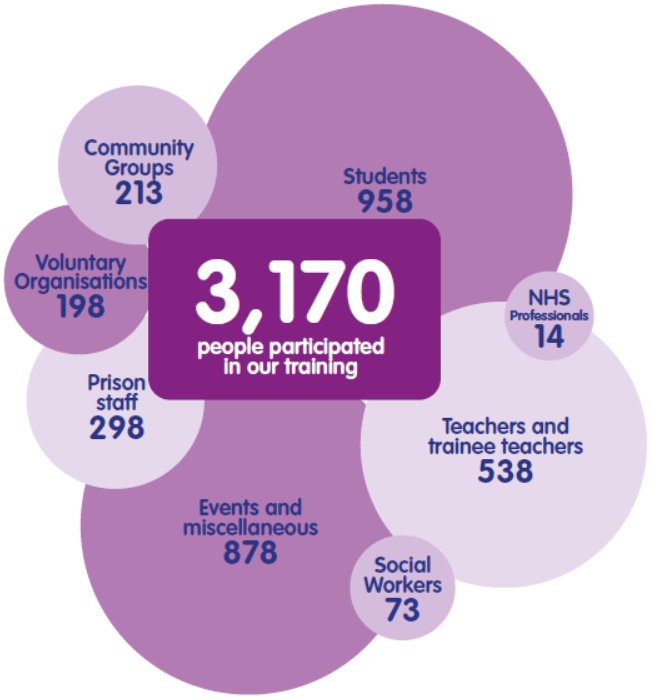 Families Outside provides a range of Training and Development opportunities to individuals and groups who come into contact with families affected by imprisonment. By supporting Families Outside, you not only support innocent families who face stigma, rejection, ostracism, and victimisation, you are also supporting society and helping to create a fairer, safer Scotland.